I can count on one finger the number of, what I would consider, successful water marbles that I have ever done. That one successful marble was during the 31 Day Challenge last year for the Water marble theme. That is until this week. To the water marble gods, I can now happily say 'Bite me', for I do not need to pray to them anymore to get a good water marble! This past week I have done four different water marble designs, and I have not needed to redo a single nail. I can't believe it, I finally cracked the water marble code! So what's the secret you ask? 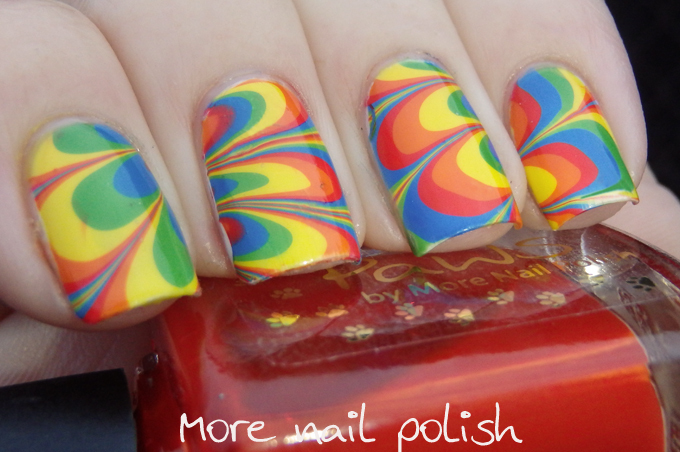 Just like the only other successful water marble I did last year, it's all about the polish. That is it! I am using the exact same technique I've always used, but unless you have the right polishes that spread in the water perfectly then it's not going to work. I recently was looking at lots of gorgeous marbled designs using Pipe Dream Lacquer. I very nearly purchased the whole set (except they weren't all available from the only shop I could get buy them from). Then it got me thinking, what is it about those polishes that makes them work so well for marbling? I pulled out my polish making supplies and got to work, experimenting with different formulas until I created the perfect polishes for marbling. So far I've made about 20 different shades using my water marble formula, a rainbow bright set, a pastel bright set, plus black and clear and a few other shades in between. I'm obsessed, all I want to do at the moment is create water marbles! Plus I no longer have to worry about filtered room temperature water, I just created these with regular tap water, straight out of the tap! 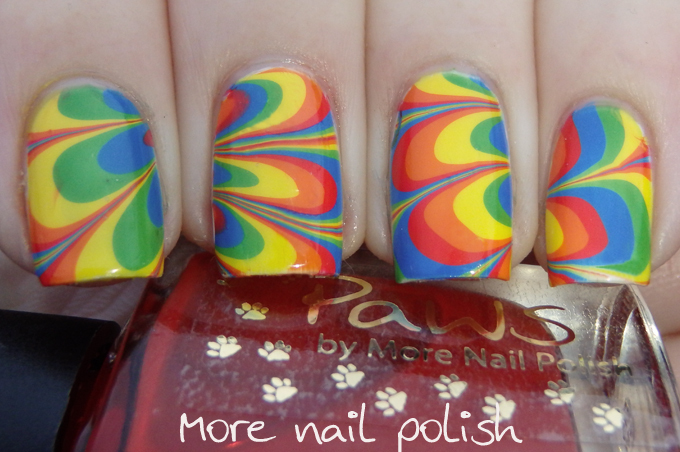 So here is my first attempt at a rainbow water marble using my Paws polishes water marble formula. Edited to add the quick Instavideo. I'll show you the other water marbles throughout this week, in the lead up to the 31 day challenge starting on September 1. Ooh that's awesome. 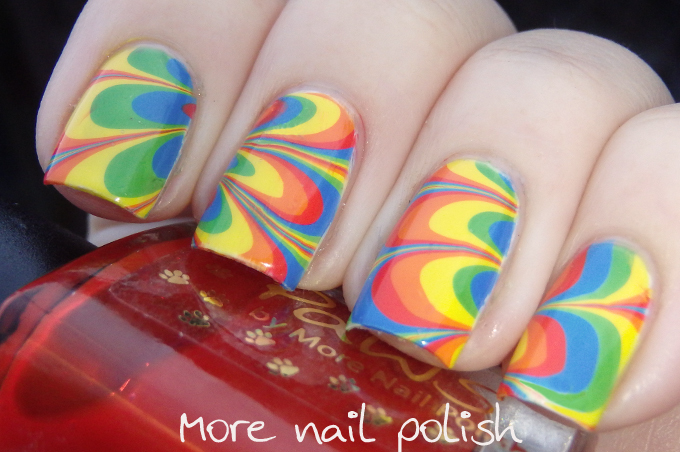 Did you find out what the secret was to perfect water marbling polish? And this one looks especially great, fun & summery. This looks phenomenal! It's definitely all about the polish, but it can be hard to figure out which ones will work well - it seems you found the perfect ones! Wow! Just... wow. That's amazing!! I haven't cracked the code yet and my attempts have been so bad that I've practically given up. 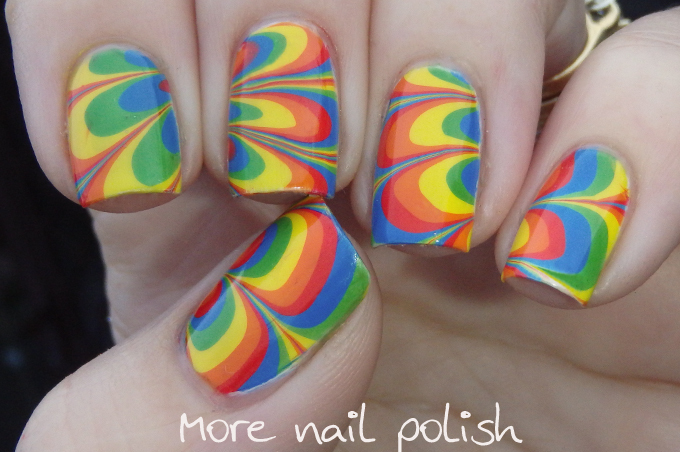 Wow , you have perfected the water marble!